This partnership project, which was initiated by Tshikululu Social Investments (TSI) with support from the FNB Foundation, was launched in April. The project targets 19 schools in the Umlazi and Umgungundlovu Districts in KZN. 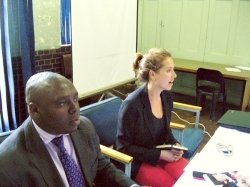 Sarah Ball, from TSI, introduced the project in Umlazi on 10 April and in Umgungundlovu on the 11th. The implementing partners of the project are Principal’s Management Development Programme (PMDP), the Catholic Institute of Education (CIE) and MIET AFRICA. The interventions at the schools will include capacity development of school management and strengthening schools to address barriers to learning and development. In addition to coordinating activities, MIET AFRICA will train and support teachers, School Governing Bodies and learner structures, with the aim of transforming schools into caring and supportive environments where all children can learn effectively.